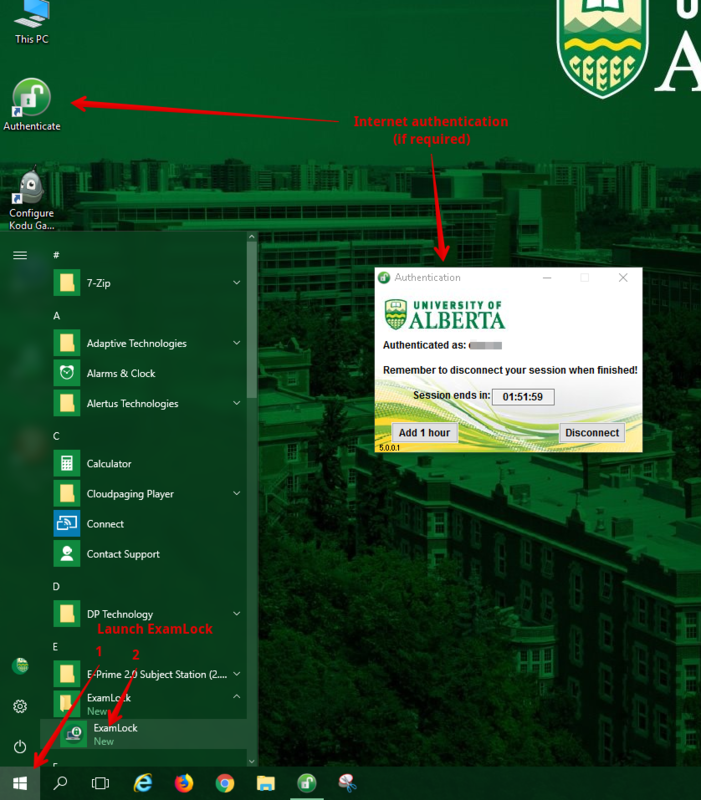 ExamLock is a University of Alberta application that instructors may use to promote academic integrity during eClass exams. The tool is available in IST managed computer labs but may also be used by students on their own laptops. This article overviews the basics of ExamLock quizzes for students in campus computer labs. For information about using ExamLock on a personal device, please see Taking ExamLock Quizzes. Users are unable to navigate away from the quiz attempt once it is started. Users cannot open any other applications during the quiz attempt. Most keystroke shortcuts and combinations are not functional during exam attempts. Screenshots of all on-screen activity during every exam attempt. Records of any attempts to exit the exam-taking application. Records of any attempts to use image-capture software during an exam. When using ExamLock, students must sign in with their CCID and are bound to comply by the campus Computing Use Policy and the Code of Academic Integrity. Please note: In all computer labs students MUST know their CCID password to authenticate the lab computers and to access the ExamLock quiz. If you are uncertain of your password because you have been saving it in your browser on your device, please verify it BEFORE attending any ExamLock exam. Students do not need to download Examlock - it is pre-installed on the computers. Students do not need to take the practice test - the computer lab computers have been already validated for use with ExamLock.